The season 5 première of Bates Motel was all the bloody mess we’ve come to expect from the series. Although this will be the final première of the show, this season has been set up to be the most thrilling. 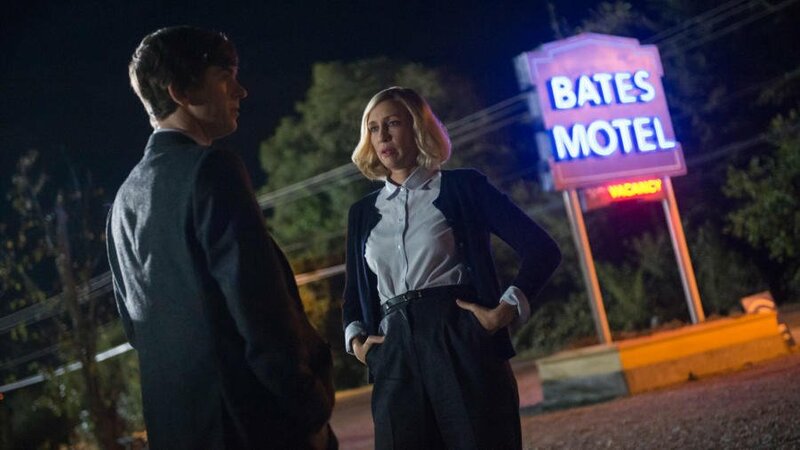 As we are welcomed back to the Bates Motel, we catch a glimpse into Norman’s increasingly vivid delusions about his mother. This picturesque world is as he calls it, “paradise”. In this paradise, Norma and Norman can live together without the threat of anyone else bringing chaos to their lives. In Norman’s mind, Norma is pretending to be dead so that she may solely focus on protecting him from harm. It is this toxic mindset that Norman has created that continues to push him further into isolation and to the blackouts that are becoming more frequent. The contrast between Norman’s mind and reality becomes more severe as we see Norma’s mummified body in a dreary house. A house hiding a new body that “Norma” had to kill to protect Norman from the consequences outside of their world. The première also introduced us to the new and improved Dylan. He and Emma had a baby and seem to be really happy in Seattle. Although, his past life comes back to remind Dylan that all is much more complicated than he wishes it to be. Caleb comes back into their lives wishing to stay, but with the history of Dylan and his father, Emma doesn’t want her daughter to have to find out about how things once were. It’ll be interesting to see how Dylan and Emma are pulled back to their past when they finally see Norman and are confronted with the reality of his mistakes. Finally we meet Romero in prison, who seems to be getting by just fine despite being denied parole. The heartbroken and vengeful man we saw at the end of last season seems to have come to terms with his beloved wife’s death and the situation he finds himself in. It isn’t long before we realize that the man “Norma” had to kill was sent on a job to kill Norman Bates, by Romero himself. There’s the Alex Romero we know. I’m not sure where the end of his story will lead but I’m excited to see it play out. Bates Motel airs Monday nights at 10 on A&E! Tune in each week to see how this incredible show concludes its final season.